Talent acquisition has been a critical success factor for any growing organization. The managers are always on their toe to reach out to the best suitable profiles for their open position to be closed and it is essential that they find a quality employee at the end of the hiring process. Social media platforms have become a handy tool for a recruiter with an inbuilt hidden feature of social behavioral. 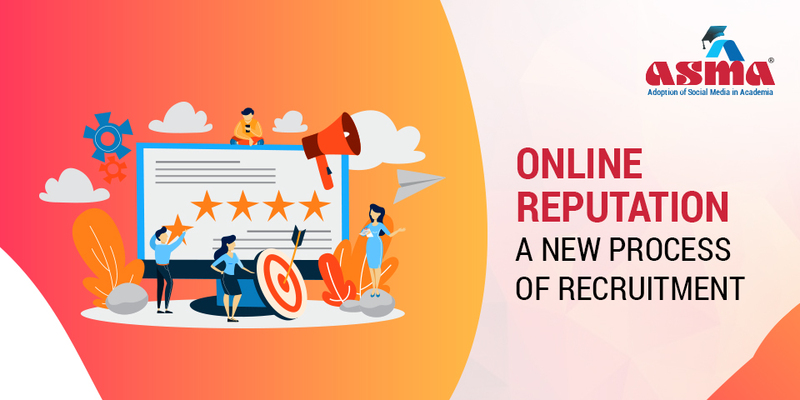 But the important question that needs to be answered is how these companies reach to the candidates via social media channel and what they actually look for?, is it about the skills and profile or conduct and behavior of candidates on social media platforms which otherwise termed as “Digital Reputation Management”. An Adweek survey suggests that 92% of recruiters use social media for finding high-quality candidates based on their social media profiles, activities and social scoring. The new terminology brings a blended mixture of traditional personification with advanced technologies. The scope of reputation has been widened across boundaries and identities. In the world of web, what kind of content a person posts, view, visit, like, dislike, share, and comment gives an idea about phycological behavioral aspect in case of living and thought & leadership aspects in case of institution or university. According to research, 80% of top companies follow the social media footprint of candidates while hiring. The institution should guide their students about how to build a positive and influencing social presence, what content they should look or search, how to be pro-active on social media channels. Academician should keep a tab on the latest trends and updates regarding industry and share it with students. Placement Cell should conduct a workshop or training session for students about online reputation management. Use of Artificial Intelligence (AI) in Online Reputation. Among the emerging social media platforms, the recruiter also believes that AI is the next big thing for future hiring and connecting with campuses across the world. As per the survey of Price Waterhouse Cooper (PwC), 72% of companies have shown confidence in AI for future advantage. The AI is being used by companies in two domains, one is for selecting the campuses and the second one is in selecting students. The AI process is being used by a recruiter in selecting campuses for placements. These AI technologies work in a systematic manner to gather historical information about institute including student’s diversity, alumni networking, placement scenario, academic quality, value proposition, and other aspects. The system works from gathering information from social media bio, shortlisting CVs to selecting a suitable candidate. Thus, technicality it goes further with cross-checking the social behavior of students applying in companies off and on campus. The degree of scrutiny is high at that point. There are many companies like HireVue, a US-based company that uses AI platforms for analyses of a video interview of candidates and give employers more insights into the recruit thus helping make a better and faster decision. Another Bengaluru based start-up Skillset which use AI platform to scan resume, databases, use social media footprint to update candidate’s bio-data and matches skills for recruitment. AI is the future of higher education, even today in a small percentage (30%) AI tools are being used by the institution in admissions like chat box, online application system, in administrative work like CRM and ERP tools and technologies, in learning and pedagogy like a virtual facilitator, Analytica tools etc. Soon this small percentage will increase to the next high level as we know Indian economy is growing faster. This high growth and sophisticated economy are cravings for talented people to work in the technically advanced environment. If higher education understands the importance of AI in their day to day functioning, the scenario will be entirely different. The university grants commission (UGC) is instructing every institution to ensure at least 50% of students have a job. In that situation, the institute needs to adapt AI for corporate relations and keep students updated about the latest trends. Institute should use AI tools to create and maintain the database of students and schedule training session for them about the online reputation management. Institute should adopt the AI mechanism to monitor student’s social media presence and guide them to keep update their social media bio. The inclusion of AI in their course curriculum.